Summary: In recent years, the United States Congress and the Senate in particular have, through a series of hearings, statements, and appropriations bills, raised their concerns over the effectiveness of U.S. assistance to Egypt, focusing on end-use monitoring and human rights vetting of U.S. equipment, the Egyptian government’s intensifying crackdown on human rights and civil society, and scorched-earth counter-terror tactics, among other issues. In August 2017, President Donald Trump’s administration withheld and reprogrammed nearly $300 million in foreign assistance to Egypt (including $195 million in military assistance for fiscal year 2016 withheld on the basis of democracy and human rights conditions), citing Egypt-North Korea relations and human rights as the primary reason. By May 2018, Congress and the Trump administration appeared to be potentially on the same page, with Egypt at risk of its FY17 military assistance falling below $1 billion for only the second time since 1983 because $65.7 million of it was reprogrammed in August 2017 and another $105 million was withheld by the Senate, as well as because of the possibility that Secretary of State Mike Pompeo decide withhold another $195 million in conditional aid tied to democracy and human rights conditions. However, in August 2018 alone, the administration released nearly $400 million in withheld military assistance ($195 million in FY16 and $195 million in FY17). This indicates that the Trump administration is not making democracy and human rights issues a priority in its relations with Egypt, while the Senate is, thus far, continuing to take action pursuant to its concerns, yielding the significance of the FY19 appropriations process. Process: The figure below details the appropriations process. At this point, the Senate and House appropriations bills have passed and will be reconciled as part of the Omnibus Appropriations Act. Egypt’s foreign assistance is primarily broken down into two categories: economic support funds (development programs, abbreviated as ESF) and foreign military financing (military assistance, abbreviated as FMF). 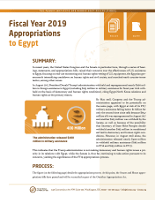 Ahead of final FY19 numbers in the Omnibus, the following presents ESF and FMF allocations and conditions in Senate and House FY19 appropriations bills, and analysis of trends and expectations in Egypt’s aid package. Congress withholds $300 million in military assistance pending the secretary of state’s certification that Egypt is taking steps to (1) release political prisoners and provide detainees with due process, (2) hold Egyptian security forces accountable for human rights violations, (3) investigate and prosecute extrajudicial killings and forced disappearances, (4) provide regular access for U.S. officials to monitor such assistance, and (5) comply with United Nations Security Council Resolution 2270 regarding North Korea. If the secretary determines it to be in the interest of national security to release these funds in spite of Egypt’s noncompliance with these conditions, he or she may exercise a national security waiver for their release. The secretary of state shall assess the efforts by the government of Egypt to provide fair compensation to U.S. citizen April Corley for injuries and losses sustained during an attack by Egyptian armed forces on her tour group on September 13, 2015. The committee report is a supplemental document to the bill which includes additional context and requirements. Requires the secretary of state to consult with committee on implementation of the April 2016 U.S. Government Accountability Office report recommendation on the need to strengthen end-use monitoring and human rights vetting of U.S. equipment. Supplements second FMF condition on political prisoners by directing the secretary of state to “consider” the cases of detained American citizen Mustafa Kassem, Ola al-Qaradawi, and her husband, Hosam Khalaf. Qaradawi’s father is Yusuf al-Qaradawi, an Egyptian citizen on the Egyptian government’s terrorist list who lives in exile in Qatar. The House has made zero percent of Egypt’s military assistance conditional, instead noting many of the conditions the Senate has set, within a reporting requirement in its committee report. The secretary of state is “directed” to issue a report to the subcommittee on the Egyptian government’s efforts to address many of the Senate’s democracy and human rights conditions on military aid, including North Korea relations, security forces being held accountable, and the dismissal of “unfounded charges and convictions in democracy-related cases,” among others. The subcommittee’s report also notes the incident in which the Egyptian army attacked the tour group in 2015 and in which Corley was injured; without mention of her name, the report urges the secretary of state to “press” Egypt to resolve the “claims arising from” the incident. The report also notes that funds for Egypt that have been withheld and “directs” the secretary of state to update the committee regularly on what is required for the funds’ release. In late 2017 and early 2018, it appeared that both the administration and the Senate were taking action pursuant to these concerns. In August 2017, the Trump administration withheld $195 million in FY16 military assistance and reprogrammed an additional $65.7 million in FY17 military aid on the basis of human rights issues, and Egypt’s relations to North Korea may have given the Senate cause to take bolder steps pursuant to its concerns. The Senate’s FY18 bill raised democracy and human rights conditions from 15 percent to 25 percent, and dropped the FMF allocation to $1 billion. The FY18 Omnibus raised conditions on military aid to $300 million, or 23 percent. But although the Senate continued along this trajectory in 2018, the Trump administration reversed its course. In May 2018, it was reported that Senator Patrick Leahy, vice-chair of the Senate Appropriations Committee, held up $105 million in FY17 military aid. As noted, the Senate’s FY19 raise FMF conditions to 30 percent and explicitly mention end-use monitoring and the case of Corley. In a span of one month, the Trump administration moved not only to release the $195 million in withheld FY16 aid (in spite of Egypt’s failure to meet any of the requirements it set), but to exercise the national security waiver necessary for the release of $195 million in FY17 military assistance given Egypt’s failure to meet democracy and human rights conditions. Egypt additionally receives relatively nominal funds directed toward International Military Education and Training (IMET); Nonproliferation, Antiterrorism, and Related Programs (NADR); and International Narcotics Control and Law Enforcement (INCLE).